This campground may go back as far as 1946 but I could be wrong. Our 1962 Shasta had its sewer pipe at the back left corner and that is what the sites in this campground are built for. 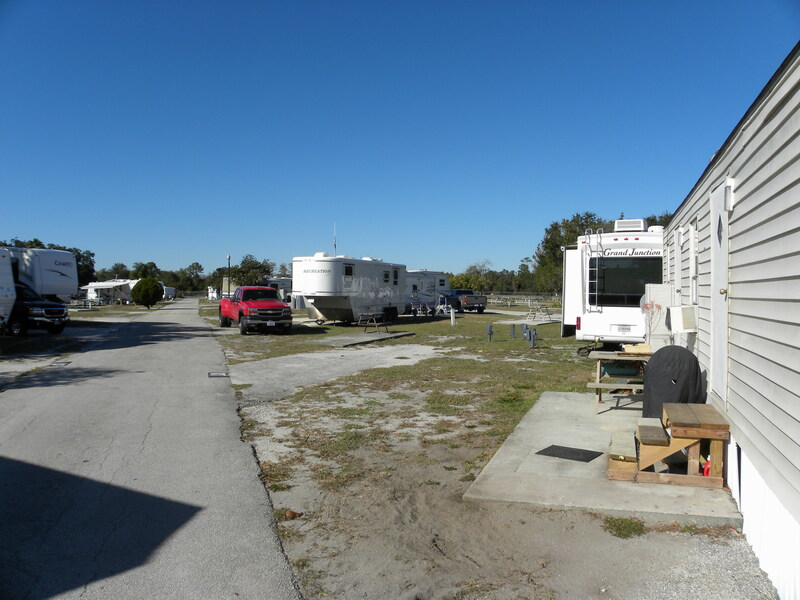 The campground literature advertises sitting under the shade of an orange tree. It could be in some areas but I fail to see it where we are. 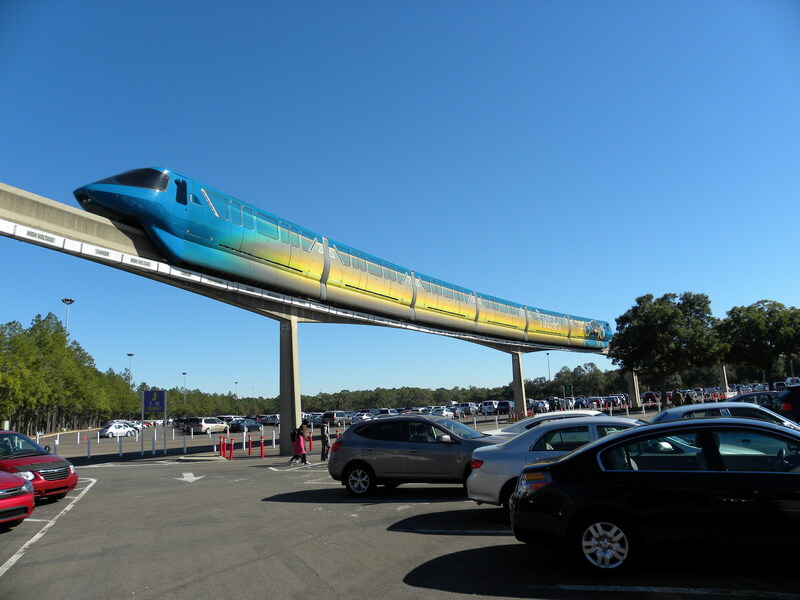 We are fairly close to the Orlando Airport but it is far from annoying. We hear the odd aircraft both turbo and jet but so seldom it does not bother one. The couple behind us are from the Okanogan Valley of British Columbia and they pulled in while Joan and I were at the Epcot Centre. They are headed for Arizona also but plan to arrive towards the end of January and not the first. They want to be back home in March. We feel confident we were never this cold while living in the Arctic for six years. It may be that we were prepared for it up there but this is unreal as stated. Our first stop this morning was a Target outlet. We picked up a movie that Josie has wanted for sometime. It was the last copy this store had for sale. We bought another GPS from the same clerk. We then picked up a few groceries in the same store. One store seems to have all or most of what one wants and makes it rather convenient. From there we topped up the old trucks diesel tank and then went on to the Epcot Centre. 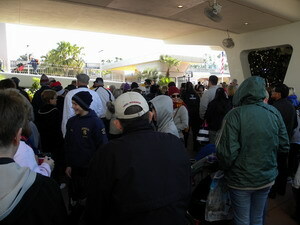 The Epcot Centre was interesting and enjoyable but like Joan said “we had to buy the place to get in”. You have been warned that Joan tells it like it is. This is Daisy Duck greeting the folks on arrival. 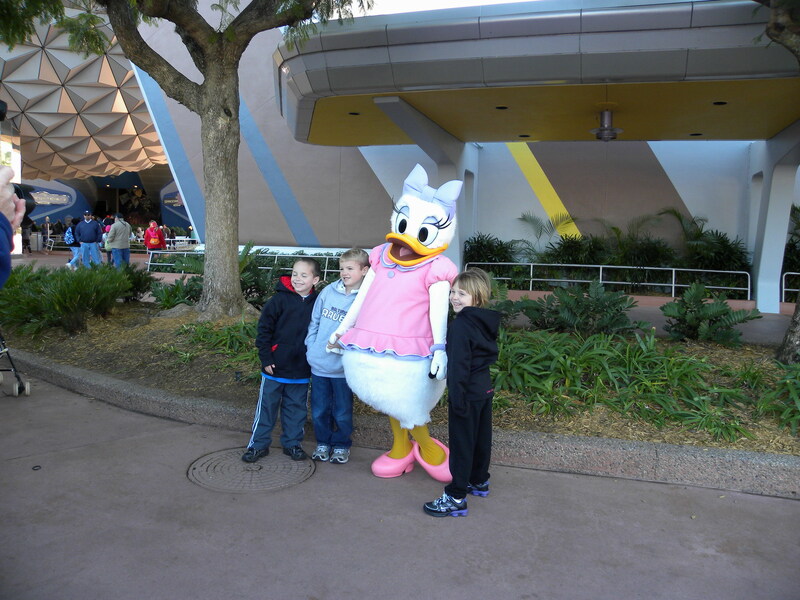 Was Daisy ever Mrs. Donald Duck? There were several things one could buy showing the wedding of Minnie and Micky Mouse. 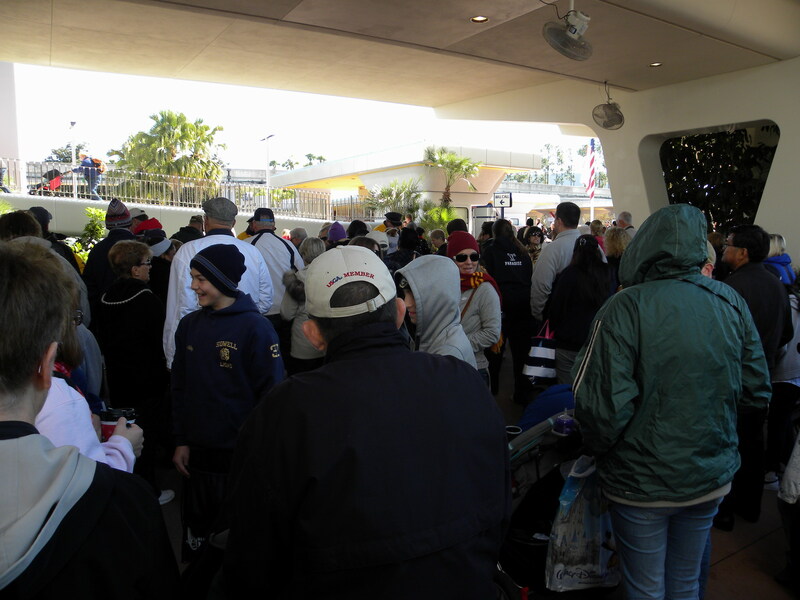 This is the mob lined up to attend the ride that takes one from prehistoric times up to tomorrow. It was most interesting and informative. When I tried to grab a photo of the telegraph exhibit I managed to get Joan's nose in it so we will not pass that on. This is an early radio broadcast exhibit and the announcer was announcing the fact Amelia Earhart was flying around the world. It is amazing that girl managed to get as far as she did with the little she knew about what she was doing. Simply study it sometime and see if you agree with me. 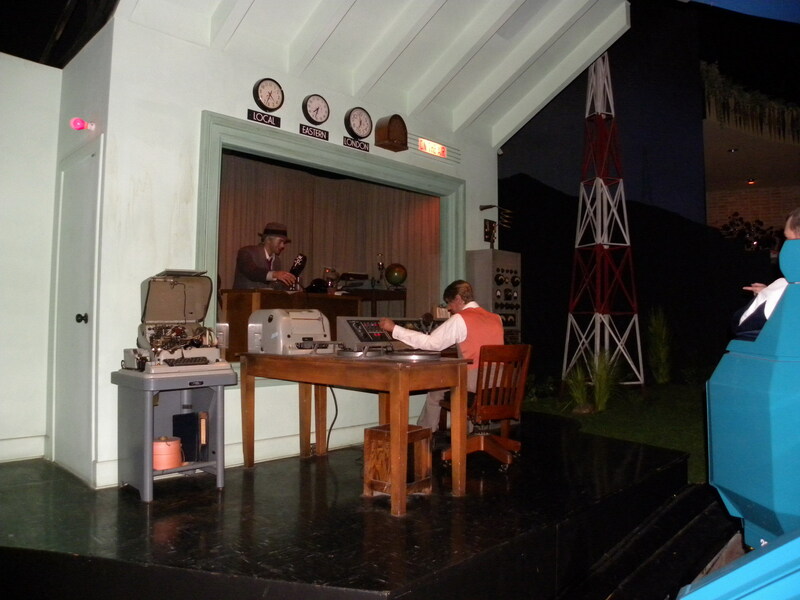 This exhibit was right after the landline telegraph exhibit. This whole exhibit was really worth freezing our butts off to see. Note how some of the folks were dressed in photo three. Some appeared to be wearing all that they owned. The performance terminated with us more or less suspended in space looking at this old mud ball earth. It is rather hard for Robert to get this on the web site so these are the only photographs I will use. This last one is the electric rail train. Where it went I have no idea but it did circle over the large parking lot. The parking area was $14.00 for the one vehicle. They called our truck a car. They had a vehicle they called a tram that looked a lot like the baggage trucks one sees running around an aircraft with the bags for the cargo holds of various aircraft. Each of the cars on this train was equipped with seats and carried people from their vehicle to the centre. Joan and I were there early enough that we were close enough and walked. It was good exercise in the cool cold air. In order to get Red Roscoe, as Josie calls the truck, into one of those stalls built for a baby carriage I had to back up and point in behind a PT Cruiser. The parking attendant put the next car in one stall over leaving the one next to us empty. That was very nice of him. He was riding one of those one man two wheel gigs that I no longer remember what they are called. Those attendants were wrapped up and still looked very cold. There was a Disney Security car running up and down the lines of parked vehicles and that made one feel good at least. There were an awful lot of Florida cars in the parking lot so one assumes the natives visit the centre on days like today. The off season. One can only imagine the mob on a nice Saturday or Sunday. It is a nice sunny day but Joan has on two sweaters, a blanket and gloves while sitting on the futon with her book. C O L D ! We leave tomorrow and with our new GPS lets hope we do not wind up in the Gulf of Mexico or some such place. 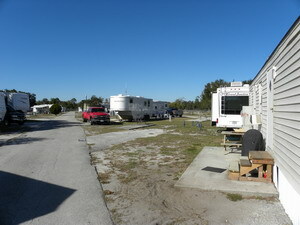 This is all for today and we are still anchored at site 86 in the Orange Grove Campground, Kissimmee, Florida.